“Did you hear that?” I asked my husband. It didn’t quite sound like the dreaded thump of a bird hitting a window but I went to look anyway. 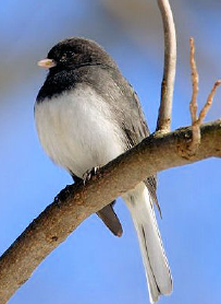 There he was – Mr. Junco – lying on his side on the patio, breathing hard. No obvious injuries were apparent – eyes were clear, wings and legs looked ok, but what do I know. I’m still a novice at this stuff. I scooped him up and put him in a small, dark box. Maybe he’s just stunned and will be up and around in a bit. A little later he was standing tall and seemed alert. So, I took him back out to see if he would join his friends but he just stood there. Okay, it’s overnight for you Mr. Junco. We fashioned a suitable place for him out of a small storage tub. Oak trees overhang the back wall so I cut a small branch for him to perch, a little water and bird seed and he was good for the night. The next morning, after it warmed up a bit and his friends were nearby, I tried to release him again. He hopped around quite a bit and ate a little food around the bird feeder. He jumped up and fluttered, but listed towards the left. He can’t fly! My husband and I chased him around the backyard (nothing wrong with those legs), caught him and placed him back in his temporary home. Looks like you are going to be staying here for a time, Mr. Junco. Susan’s instructions were to look at the symmetry of his wings. They look good – he holds them close to his body and the tips of the wings meet nicely together at the base of his tail. When I carefully spread open each wing, all the feathers look fine. He’s very alert, eating well, and perching. Susan suggested some millet sprigs which he quickly munched on. With my little experience at feeling the keel of birds, I can’t really tell if he is undernourished or not. I can feel the keel, and there seems to be some plumpness next to it. Good grief, I’ve been a vegetarian for over a decade, I hardly remember what a chicken breast feels like, but maybe it should be a bit fleshier. Well, he can rent for as long as he needs. All the joy the birds give me in the backyard more than covers the rent. He is welcome to stay as long as he doesn’t suffer apoplexy when my cat, Max, hollers for food. Max is either sleeping or eating or hollering for eats. Mr. Junco made it through a couple of mornings so he’s a spunky little guy. I’d always figured if I needed, I could keep a bird in the second bathroom. But, when he arrived, there were two ladders, painting supplies, a small table and other paraphernalia in there since my husband had been painting the bedroom next to it. Mr. Junco’s first home was in the pantry. Not exactly ordinary, but it worked in a pinch. Shortly, he moved to the bathroom. By the sixth day, Mr. Junco had been feeling very feisty – fighting to get out of his temporary home and out of my hand when I picked him up and he cheeps at me when I visit. Again, we tried to release him. He ran around a lot, tried a short flight with some control, but he couldn’t get any lift. Susan thought there might be a problem with his tail. Seeing the changes day-to-day rather than the once a week visits I made to the Feed Barn last summer have been very helpful, but obviously I still have a lot to learn. His tail – how do you check his tail? How many feathers should be there? They look the same length as his friends out doors. Then, of all things, the next day there are two fewer feathers in that tail. I don’t know how or why, but two white, outer tail feathers were not attached to this bird! The tail feathers came from the left side – the side he was laying on when I found him. Something is still not quite right – soft tissue damage, something unseen with his tail, something…! Mr. Junco will be staying at his vacation home a little longer. Food is good, there are no predators (well, except Max, but he isn’t allowed any where near the bird; and for the most part, he doesn’t even seem interested). Day 15 – he’s doing well, so well, he got away from me last night and took a small flight in the bathroom. He landed on a hanger where I had been drying a sweater the day before. Fortunately, the sweater was no longer there or the poop that landed on edge of the bathtub would have been on the sweater. He took off from the hanger, but there’s no place to perch in the shower and I was able to catch him in the bottom. He can fly, but it’s been freezing outdoors. We’ve closed the heating vent to the bathroom, and he is doing somersaults and hanging upside down from the mesh top of his temporary home. He feels good and plump. Susan says a sunny day would be best. Sunday a storm is coming in, so we will see what the weather is like after that. Monday – it’s sunny, not very warm…only about 40 degrees. But a storm is coming in again Tuesday night, so today looks like the best day. Late morning, I pick up Mr. Junco from the bird hotel (the bathroom) and we take him outside. His buddies are in the usual morning place when not eating – the elderberry tree on the opposite side of the fence. It was perfect! I gave him a little lift into the air and he took a perfect 80 foot flight right to his friends. Good luck Mr. Junco. I wish you well. Oh, and I’m hooked. This was great.